Any veggie that grows into sprouts in jars will continue to grow into microgreens on soil. This is as true for seeds as for beans and grains. But for now we shall confine our discussion to the botanical classification strictly named seeds. Trick or Treat! Seeds intended for growing sprouts or microgreens are always untreated. Gardening seeds, however, are routinely treated with fungicides and sometimes insecticides. That poses little health risk if the seed starts small, if the plant grows large, and if the growing season stretches long. But for microgreens, beware! If the seeds are treated, the trick is on you! 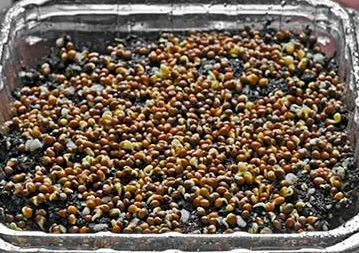 For growing microgreens, seek only untreated seeds. Mail order sources for gardening and farming seeds number in the hundreds, but only one or two dozen offer untreated or organically-grown (OG) seeds. Organic is preferred to conventionally grown, except when either poverty or parsimony dictates thrift. All OG seeds are untreated, but not all untreated seeds are OG. The need for untreated seeds levels the planting field considerably, and yet the number of suppliers of untreated seeds still presents a daunting choice. For a clickable and current listing of most mail order sources, download my 2MB PDF titled SEED SOURCES by clicking on the green button on the bottom of this webpage. CULTIVAR name enables you to identify and thereafter seek the variety you like best. (For a detailed discussion about the cult of cultivars, scroll down to Section 5, titled “Seek Certain Cultivars of Seeds.”) When gardening seed suppliers offer many cultivars of, say, broccoli, plus one in bulk specifically for growing microgreens, the cultivar for microgreens usually is not specified. All you really need to know is that the supplier recommends this specific seed for microgreens. But if you wish to take your gardening to the next level of expertise, and to explore further varieties of, say, broccoli, then you do need to know its cultivar. DATE of harvest forecasts seed longevity. (For a detailed discussion about viability and longevity, scroll down to Section 6, titled “Preserve Seed Viability.”) Some seed companies shun commitments and instead label packets with Date of Packaging or with Expiration Date. Both evade the issue. Look for Harvest Date. GERMINATION rate diminishes over time. The rate as stated is at harvest, so only a starting point from which your own results can only decline. Less than 90 percent is unsuitable for microgreen gardening because the errant 10 percent will rot, and sown close together can cause the other 90 percent to rot too. ORGANIC certification need not necessarily mean USDA certification for seed vendors located in the United States. Other regional certifying agencies also monitor and attest to organic farming methods, but they must use some label other than Organically Grown. For instance, Natural Grown passes my muster, and my mustard. BOTANICAL name may provide a difficult way of learning Latin or Ancient Greek, but the only efficient way of learning Botany. Botanical family names are especially useful for Asian species known to Westerners by Japanese or Chinese names but seldom by both. Even names in English can cause confusion. Canadians are better informed, but few Americans would suspect that Cos and Rocket are the British names for Romaine and Arugula. As a beginner, you must choose from an overwhelming and confounding diversity of seeds. If you intend to grow, say, broccoli, you might consider omitting from your repertory many other members of the Brassica family such as cabbage or kale or turnip. As microgreens, they are very similar. Perhaps you are wondering how plants as diverse as kale and cabbage, or broccoli and turnip, could belong to the same family. You will understand when you view their seeds and their microgreens, as they all look the same. But they do not taste the same. Each microgreen tastes usually the same as its full grown outdoor “macrogreen,” but when eaten raw. Among the Brassicas, broccoli seeds are the most widely available, including in natural foods stores and catalogs. Broccoli is a good starter seed, but hardly the final word, as it lacks much by way of taste. (Who but the most resolute raw foodist eats mature broccoli raw?) Broccoli does not even make either of my two lists of Top Ten. Here is a recommended list of Ten Microgreens Easy for Beginners, meaning the seeds readily germinate within 4 days or fewer, and the greens grow so rapidly as to assure initial harvest within one week since germination. After you successfully have grown many of the above list, you may wish to accept greater challenges that do come with greater rewards. These next ten excel in the Department of Delicious, but require longer times for both germination and growth. To sum up: restrict your initial seed collection to only ten types, and just maybe to these Top Ten. Small packets of seeds are ideal for a brief one week stand or spring fling. Then if you favor its flavor and vigor and are ready to commit to a more enduring relationship, reorder a quantity measured not by seed count, but by the ounce, quarter-pound, or pound (fifty gram, hundred gram, or half-kilo). Do so as soon as possible to assure it is the same crop. Before 1990, some pioneering sprouting folks grew microgreens at home, but the high price of seeds prevented anyone from marketing microgreens. Wider interest during the 1990’s created a new demand for untreated bulk seeds that previously hardly existed. The marketplace soon responded by offering bulk quantities. As bulk implies affordable price breaks, an affordable supply stirred further interest and fueled further demand, which continues to this day, thanks to you! All seeds are truly seed money. Prices vary widely from species to species, and among cultivars within the species. Some are dirt cheap, while some are almost worth their weight in gold. Rather than dig for gold, you can grow it. To sum up: Patronize sources that sell bulk quantities. Varieties among a single species are called cultivars. Do not confuse the word cultivars with cultivators. A seed is the cultivar, while YOU are the cultivator. Dozens and sometimes hundreds of cultivars have been selectively bred for each species of our food plants. For instance, cultivars among apples include Golden Delicious, Granny Smith, and Macintosh. For microgreens, let’s examine Italian broccoli, which Westerners know simply as broccoli. (This excludes Romanesco broccoli, Chinese broccoli, broccoli raab, and broccoflower, all which are distinctly different species.) From three seed companies that offer some or all seeds organically grown, you can choose from among 24 cultivars just of broccoli. The United States Department of Agriculture (USDA) Vegetable Laboratory lists 144 more grown just in North America. Total: 168. (And more on the way!) Some more fanciful names of broccoli cultivars include Crusader, Excalibur, Hercules, Munchkin, Ninja, Pirate, and Samurai. Alphabetized from A to Z, the ascendant cultivar just happens to be named Apex, while paradoxically at the bottom of the list slumps Zenith. What cultivar have you purchased? Broccoli seeds sold specifically for growing sprouts or microgreens are rarely identified by cultivar. Instead, they are labeled simply and generically “broccoli.” Fair enough, because these always cost less than the other broccoli seeds whose cultivars are named. If you are especially fond of broccoli microgreens from seeds from one source, when you later replenish your supply from that same source you have scant assurance that it will be the same cultivar as before. On the other hand, this may not matter, as you might not taste any difference among cultivars of broccoli when grown only as microgreens. Thus “generic” broccoli may be broccoli enough. As seeds age, they decline in viability and vigor. Viability is the ability to germinate. Vigor is a measure of the strength and health of the seed. Vigor declines before does viability, so just because a batch of seeds germinates does not guarantee a harvest. Seeds manifest life. Seeds are dearly precious, but also highly perishable. Refrigerate seeds to preserve viability and vigor. The elements of air, moisture and warmth ignite germination. Their opposites, namely an airtight enclosure, low humidity, and cold enhance long term storage. Also, fluctuations between warm and cool such as occur between midday and midnight promote germination. Again, the opposite condition of constant cold, especially if just above freezing, promotes longevity. So store seeds in your fridge year round, not just in summer. Or if your fridge lacks room, use your wine cellar. Or if you are less privileged, resort to your root cellar, if you even know what that is. Or if their water content does not exceed 8 percent, store seeds in your freezer. That magic number may be interesting to know, but is not very practical to apply. Beyond 8 percent, the freezer offers a very icy reception. Water turned to ice disrupts the seed’s cellular structure, which destroys its spark of life. Before refrigerating them, first remove the seeds from their ineffective paper envelopes or nearly as useless thin plastic bags in which you purchased them. Plastic bags can be watertight, but still not airtight. A new generation of food barrier plastic bags, of which one brand name is Cryovac, do seal out air, and some even absorb oxygen. They actually rival glass jars. To verify a plastic bag as airtight, go stick your nose right on it. Can you smell its contents through the sealed bag? If odor is leaking out, then air is seeping in. Transfer seeds to a glass jar and verify that the gasket on the underside of the cap is pliable, otherwise with age it can turn brittle and no longer effectively seal out air. A jar is only as airtight as its cap. Close its cap tightly. Now can you smell its contents? Seeds are dormant, but alive. Over the course of time, seeds die, same as all that is alive. A dead seed sown in moist soil will molder in its grave. Treated seeds intended for outdoor gardens are chemically treated precisely to inhibit mold. Dead treated seeds do not rot so readily. When they do rot, they are not likely to contaminate other live seeds because in an outdoor garden they are sown far apart. Untreated seeds for microgreens, however, are sown close together, and so can infect each other. Thus a high germination rate is especially crucial for microgreen gardening. Even when properly stored, eventually diminished vigor renders seeds no longer worth sowing. But when exactly? The short answer is: it depends upon species, but usually from three to five years. The even shorter answer is: five years absolute maximum. Q: How long can seeds be properly stored and still maintain a high rate of germination? A: Everyone seems to repeat information from someone else, and yet no one seems to agree with anyone. The wide ranges here were compiled from books, seed catalogs, the USDA, and university agriculture department websites. Label the contents. Along with storage, think signage. Identify the seeds, their source, and the date purchased. Consider trimming the seed company’s label from the envelope or bag, and taping it to the jar. Do not forget that as we grow older, we forget more and more. But as we grow wiser, we understand that we indeed do forget, so to compensate we write notes more and more. To sum up: purchase no more seed than you can store in your refrigerator and that you can use up within five years. You really need to measure seeds in advance of sowing only if you soak seeds in advance of sowing. To grow an avocado plant, you would place only one single pit in a pint (half kilo) container of water. To grow an oak tree seedling, you could fit 10 acorns in that same size container of soil. To grow sunflower microgreens, you might fit 100 seeds. To grow lettuce microgreens, you might fit as many as 1000 seeds. The smaller the seeds, then the greater the number of seeds that fit onto a given surface, and so the smaller the volume of seeds. In short, measurements vary depending on the size of the seed. Furthermore, small containers that hold half-pints (quarter kilos) or pints (half kilos) of soil actually offer additional surface areas as plants lean outward and spread beyond their perimeters. But deep trays with tall lips and broad surface areas allow no such territorial expansion beyond their borders. Thus measurements vary according both to size of vessels and to type of vessels. 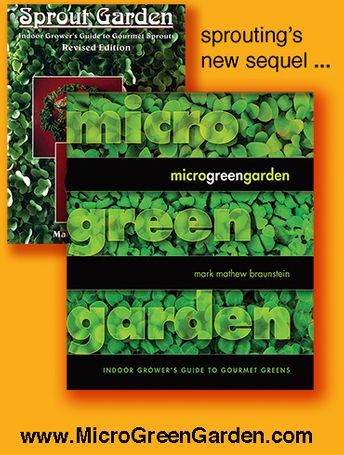 Hence maximum measurements are provided in the chapters on Container Gardening and on Tray Gardening in my book MICROGREEN GARDEN: Indoor Grower's Guide to Gourmet Greens. To sum up: when measuring seeds, match species to vessels. Soaking seeds for a few hours before sowing will hasten germination, thereby reducing total growing time by as much as a day. Fill a small jar with water and seeds, cap it, and shake it. Aerating the water further benefits germination, which requires both air and water. During soaking, uncap the jar so air flows freely then too. When ready for sowing, pour the babies and the bath water through a sieve or sprout jar cap. Tiny seeds, for instance lettuce seeds, are too pesky to handle when wet, so do not soak those. And absolutely do NOT soak mucilaginous seeds such as basil or arugula or chia, or you will have a mucky mess on your hands. Lay the seeds evenly and thinly upon the soil. The most frequent error most beginners make is sowing seeds too densely. And not just beginners make this mistake, as I, too, sometimes still make this mistake. Even with bottom watering, overly thick growth traps moisture among the stems just from their natural process of respiration. Such moisture fosters the growth of mold. Sow too thinly and your harvest may be meager, but you harvest nonetheless. Sow too thickly, and you may reap only mold. Think thin! Just as you can provide too much water or too much light, you can apply too many seeds. Allow ample “breathing” room between seeds. Seeds should not overlap nor have any contact with other seeds. Even if you think you have spread them too thinly, they probably still are spread too thickly. So err on the side of thin, and you probably will not err. Deep-bowled measuring spoons are excellent tools not just for measuring seeds but also for sowing seeds. Gently shaking the spoon usually proves too shaky, as seeds spill from both sides of the spoon. Instead, hold the spoon with thumb and middle finger, and gently tap its handle with forefinger. This enables more precision, as seeds will spill out only from the one side facing you. Or if the seeds fit through its holes, fill an emptied salt or pepper shaker, and shake that. Some tiny seeds, notably basils and many lettuces, are the same dark brownish black color as soil, so it’s difficult to see where you’ve covered ground. Within minutes of contact with the moist soil, basils swell and turn purple. So you very soon can see bare spots, and can add seeds where needed. For other dark seeds, you may have to wait until they begin to germinate. The radicle (radicle, not radical!) root that first sprouts usually is light colored. So fill in the gaps upon germination and the latecomer seeds will lag behind by only a day or two. Cover with soil only the very same seeds you soaked. Cover with soil those same seeds listed under STEP 8, Soak the Seeds. Soil better assures that their pods and hulls stay thoroughly moistened and more likely are cast off. Otherwise, upon harvest you will need to remove many of the hulls and pods manually. An exception is sunflower, because for unknown reasons soil atop the seeds seems to cement the hull to the leaf. Make a good impression. Except for seeds you already have covered with soil, and except for mucilaginous seeds, use only your fingers and gently press the seeds into the soil to assure contact. Do not cover them with soil, else at harvest time many of the succulent leaves will be encrusted with earth. Savor this moment, because the next time you interact as intimately with these seeds they no longer will be seeds. They will be microgreens.